The Cataclysm set to change the face of Azeroth this December is also changing the SteelSeries World of Warcraft MMO Gaming Mouse, and the differences go way beyond the cosmetic. In 2008 SteelSeries introduced the original World of Warcraft MMO Gaming Mouse, and it was an excellent piece of technology, if a bit uncomfortable and single-purposed. As the world of Azeroth prepares for a major change, the peripheral manufacturer prepares an update of its own, stripping the number of buttons down from 15 to 14, changing its shape, and adding improved functionality to make sure it's supplying players with the latest tech. Fifteen programmable buttons was apparently one button too many. The new design only houses 14 clickable bits, but that's still plenty more than your standard mouse has. The dropped button is a result of user feedback complaining of uncomfortable, often unreachable buttons on the first design. 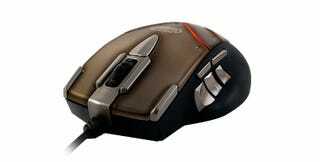 The new MMO mouse is outfitted with the same technology as the SteelSeries Xai Laser Mouse, allowing players to store one profile on the mouse hardware itself, and up to 10 custom profiles using software on PC or Mac. The new SteelSeries World of Warcraft MMO Gaming Mouse will be available for $99 in time for Cataclysm's December 7 release. It'll be available at next weekend's BlizzCon 2010 in Anaheim, California, where players will be able to stroke it lovingly. I'll be there, so drop me a line and I'll stroke it for you.